Now imagine eliminating that pollution at the source. We're not talking about spraying a cloud of flower-fragranced chemicals. Our solution is as easy as pushing a button to keep things cleaner and safer to touch, not to mention smelling fresher. 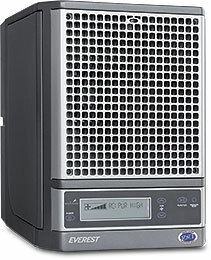 The FreshAir Everest is a revolutionary air purifier that does so much more than clean the air. Using the same science as nature, FreshAir Everest destroys odors, eliminates smoke and reduces harmful contaminants or pollutants ordinary cleaning can leave behind. FreshAir Everest is like 24/7 healthy home insurance. It is the core of a total protection package for whole-home environmental conditioning. FreshAir Everest is always working - sending out an active army of safe and natural ions as well as pollutant-controlling, odor reducing and oxygen-rich 'scrubbers' to make your home safer and healthier.